Are you looking to really livin up the party and get everyone involved?! We have our Karaoke Machine here for you! Wether your little boy or girl wants to have a seeing Karaoke party in the backyard or the adults want a night of good times and Karaoke this machine is for everyone! Team building event or Holiday party? It is perefect for that too! We promise you a party with Karaoke is bound to be a blast and one that no one will soon forget! Includeds (2) wireless microphone which makes it perfect for dual or singles sing-along karaoke parties, Bluetooth audio streaming plays all of your favorite songs wirelessly, built-in flashing DJ party lights add visual effects to the high-powered sound, along with a fold-out 10'' digital display screen and CD/DVD player! Use the system at home, on stage or in the auditorium, perfect for all of your event needs. Also includes, USB & SD Memory Card Readers, FM Radio along. 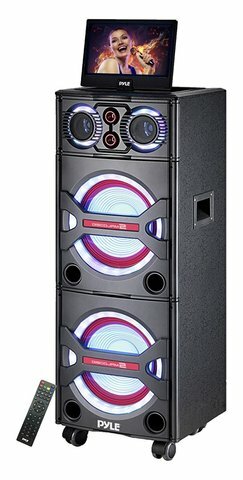 Get the party going and put on a show with our Karaoke machine!